Designed for pool and spa professionals. 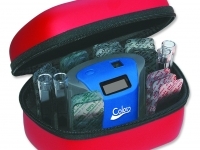 Measures seven key pool and spa tests, including Free Chlorine, Total Chlorine, Bromine, pH, Alkalinity, Calcium Hardness and Cyanuric Acid. Uses tablet reagents. Sufficient for 50 tests. 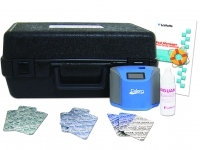 Measures eleven pool and spa tests, including Free Chlorine, Total Chlorine, Bromine, pH, Alkalinity, Calcium Hardness, Cyanuric Acid, Copper, Iron, Biguanide and Biguanide Shock. Uses tablet reagents. Sufficient for 100 tests.